Hey there friends. My cuz is spearheading a fundraiser for the local kids basketball team. The kids have a tournament that they are trying to get in to during the Thanksgiving week but are a little short on funds. The fundraiser is targeting adults that would like to spend a day at Harrah's Casino in San Diego. Raffles and games will be played and food and drinks (coffee, soda, water, BEER) will be given to all participants. Each ticket is $25 so if you're interested in helping out our local kid's basketball team, please shoot me an Email and I will give you the details. The trip takes place this Saturday. You need to live in the southern California area to attend but if you want to donate any funds, please use the donate button on this page. Anyone that makes a donation of a dollar or more will have a link on my site for the remainder of the year under the "Supporters of the Southeast Warriors". Make sure you leave your online "identity" in the description so that you can get your link up. Many thanks friends and thanks for the support. Later! Here is the team and their coaches. 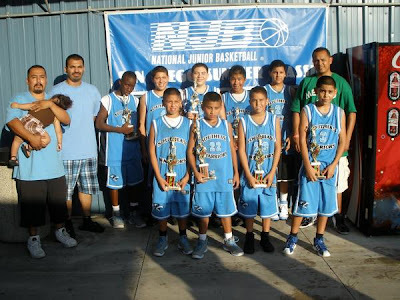 They won first place in the San Diego NJB Tournament. cool beans. As soon as I can get some extra funds end. I'll shoot some to the donate button.